Joshua Cole was only 73 votes away from winning this district in 2017. In 2017 Josh was the first African American to receive any party's nomination for the 28th district. His close 2017 election was riddled with controversy where 143 voters were given the wrong ballot. Josh started his career in politics in 2005 as a page for the Virginia House of Delegates. He served as a Staff Assistant to the Clerk of the Virginia State Senate in 2016 and most recently as Delegate Fowler's Chief of Staff. 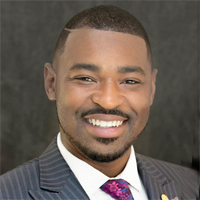 He currently serves on the Stafford County Public School's Superintendent's Equity, Diversity and Opportunity Committee, the greater Fredericksburg Area Interfaith Council, and is the President of Stafford County NAACP. Healthcare For All. Lets make this clear: healthcare is a human right, not a privilege. Last year we pushed through Medicaid expansion, but Republicans tacked on work-requirements. Now, we've got a job to finish: repeal the requirements. A $15/HR Living Wage Virginians are struggling under the current system. A $7.25 minimum wage is not cutting it. Meanwhile, the top 10% make 237 times more than the poorest 10%. We need to protect unions, reach equal pay, and raise our wages. Bob Thomas voted against allowing the ERA to come to a vote in the House of Delegates.